Secrets, betrayals, intrigue, heartbreak, love, loyalty, hope. 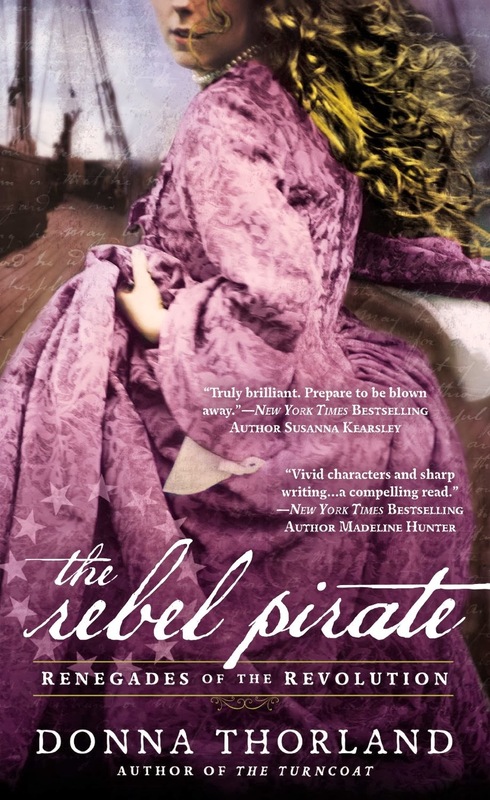 All are themes in play in Donna Thorland's fascinating new novel, The Rebel Pirate. Set in 1775 in Colonial Massachusetts, the story plays out against the backdrop of the tumultuous days leading up to the American Revolution. The daughter of a notorious pirate, Sarah Ward wants only to care for her family and begin a secure, respectable life as the beloved wife of successful merchant Micah Wild. But when Sarah's family loses their fortune, Micah breaks her heart by marrying her best friend then puts Sarah and her younger brother in danger by smuggling arms and Rebel gold aboard one of her father's ships. When that ship is overtaken by a British ship it is only through the quick thinking of Sarah, disguised as a boy, that the tables are turned. Master and Commander James Sparhawk is a well-respected British Naval officer but not without his enemies, most notably his second in command. When James makes the decision to avoid bloodshed by sending the captured gold back to his ship with his lieutenant and crew, he places himself in the gun-holding hands of Sarah Ward and her promise that he'll be put ashore unharmed at the first port. What he doesn't know at the time is that the gold will go missing with the blame being cast on James and labeling both him and Sarah as traitors to the Crown. As Sarah and James grow closer their loyalties are put to the test. Loyalty to opposing sides in the coming war and loyalty to one another. Sarah's father's health is deteriorating, she suspects one brother is involved in secret Rebel activities while the other is at risk of being impressed into the British Navy. They are her priority and keeping them safe is paramount. She's falling for James as he is for her but he cannot offer her marriage. His name is not his own to give away and if he chooses to publicly reveal his true identity it could place Sarah in danger. When James is imprisoned and Sarah is at risk of the same, rescue and protection come from an unexpected source and difficult decisions must be made. Caught between British officials and Colonial rebels, between the reality of their present and the secrets of their pasts, they must play both sides in a dangerous game to have any hope of avoiding the hangman's noose. But there are still twists and turns, secrets, betrayals and unexpected revelations that will test the strength of their feelings and lead to a heart-stopping conclusion. Donna Thorland is a master at creating a sense of time and place. In The Rebel Pirate, she plunges the reader into the heart of a country on the precipice of war in a winner take all fight for independence. Her writing is crisp, the action realistic and well paced with vividly drawn characters who fairly leap from the page. Thorland seamlessly interweaves real people and historical events with fiction to create a compelling story that captured me from the start and had me flipping pages as fast as I could until I reached the very satisfying conclusion. In fact, her fictional characters and events blend so effortlessly with real ones that after reading one of her books, I expect to open a history book and find them listed in its pages. 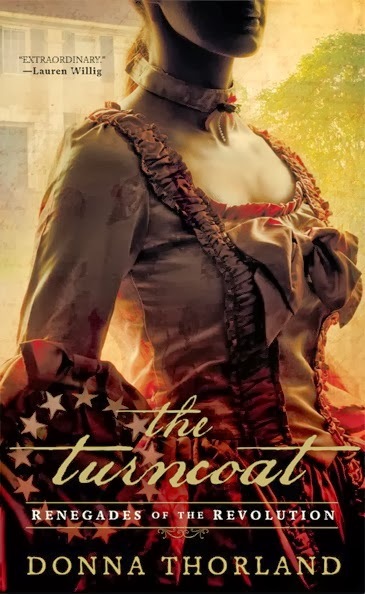 I have thoroughly enjoyed Donna Thorlands's books The Turncoat (read my review here) and The Rebel Pirate. If you haven't tried her Renegades of the Revolution yet, I highly recommend both. What about you, readers? Do you enjoy books set in Colonial America? Have you read Donna Thorland's books yet? Are there other books set in this time and place that you would recommend? What made you decide to write the Renegades of the Revolution series? I wanted to read a swashbuckler set in 18th century America but no one was writing them. TURNCOAT? Do you think the novels work just as well alone as together? Both novels are standalones. THE REBEL PIRATE takes place earlier in the Revolution, when no one on either side of the conflict was quite sure if they were at war or not. What they share is strong heroines and a view of the American Revolution as a civil war rife with forgotten intrigues. They do work well together, and also share some background characters: both historical, and invented. What inspired the character of Sarah Ward? What about James Sparhawk? When I worked at the Peabody Essex Museum in Salem I managed the interpretation of our historic houses. (http://pem.org/visit/historic_houses) It was in intimate window into the lives of 18th century women in a privateer port, and when I started to write THE REBEL PIRATE I drew on that experience. The Crowninshield-Bentley House in particular served as a model for Sarah Ward’s home. James is part Alexander Hamilton, whose childhood—and probable bastardy—on Nevis shaped his character and formed his revolutionary ideals. And James is also a little bit James Annesley, the heir to the Earl of Angelsey whose story inspired Robert Louis Stevenson’s Kidnapped. I love historical books whether they are set in Colonial America or elsewhere. No, I haven't read any of Donna's books yet. The Rebel Pirate sounds very good. The only Colonial America books I can think of right off the top of my head are Zane Grey's Betty Zane books. Thanks for the giveaway! Cathy, I share your love of historical stories. Colonial America is one of my favorite settings and there just aren't that many books out there set in this period. Thorland has a really wonderful voice and an excellent knowledge of this time and place. It looks like an exciting story. I haven't read any stories by Donna but I like the idea of the colonial setting. I like all types of settings but can't think of many that feature it. I think Carla Kelly has done some. Carla Kelly is a terrific author, Maureen. I love books set in colonial America. I look forward to reading this one. If you like colonial America then I definitely recommend Thorland's books. I haven't read any of Donna's books yet, but they sound great. I'm looking forward to reading more books set in the Colonial and Revolutionary periods. Great review and interview! I'm excited to hear about these books. Elswyth Thane's Dawn's Early Light and Gwen Bristow's Celia Garth were among my favorite books as a young teen, and they left me with an abiding affection for historicals set in the American Revolution. If they add romance, so much the better. I totally want to read this book!! I'm so glad someone is writing about Revolutionary War America!!! LOVE IT! Me too, Hellie. I'm a big fan of this era! what a wonderful feature. I am interested in this era and the novel sounds captivating and special. Traveler, "captivating" is a good description of Donna Thorland's books. I have a hard time putting them down. This historical sounds fascinating. I haven't read Donna's books but look forward to this exceptional book. I haven't read her but I'm sure I would enjoy her stories. The one that comes to mind first is the first series that I read and it was written by John Jakes (quite a while ago lol). I haven't read John Jakes in years. I've always enjoyed his books. Hope you enjoy her books if you decide to give them a try. I have not read her books before and I love books set in about any historical time. Me too, Quilt Lady. I hope you give Donna's books a try. Janice, like you, I love early Americana fiction. There just isn't enough of it to make me happy but Donna's books make me very happy! I have not read hers, but this one looks interesting. I love that time period. Outlander series and Into the Wildnerness both have Revolutionary War books. I love to read about the American Revolution, and stories set in this era are hard to find. I am looking forward to adding this one to my TBR pile!! I enjoyed Gilbert Morris' books set during that time period (as well as other times and places) as well as Sally Laity and Diana Crawford's Revolution series Freedom's Holy Light (all three are Christian authors, and excellent story tellers.) Thanks for the review, PJ!! The way you described the writing as crisp and the words jumping off the page definitely makes me want to read the book. I haven't read any of her titles but that will be remedied soon! This is a new to me author and I think this book sounds fantastic! I haven't read really anything set in colonial times, let alone with pirates and i'm very intrigued :) Thanks for sharing! I've always been drawn to stories set in Colonial America; like the John Jakes books, Last of the Mohicans, the story of Betty Zane, and more recently Pamela Claire's MacKinnon's Rangers. I haven't read any of Donna's books as of yet but look forward to this. I do love books with Pirates but I also enjoy reading about Colonial America. There aren't that many out there but maybe I've just missed them. I can't think of any titles but Laurie Lewis has a 5 book series that is just amazing called Free Men And Dreamers. You will Love these books. I have GOT to read these books. I enjoy reading books set in Colonial America, but there are not enough of them available. It is such a perfect time to be writing about. There is more than enough action, intrigue, danger, adventure, romance, and characters to make some wonderful stories. Pamela Clare's series set during the French and Indian War, MacKinnon's Rangers, is good. It is set in my home area and is very true to the place and the history. PJ, I missed your review of THE TURNCOAT. We must have been out of town. Too bad I didn't learn of Donna Thorland's books sooner. I will be looking for them. Thanks again for introducing an author and her books to us.